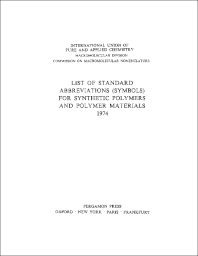 List of Standard Abbreviations (Symbols) For Synthetic Polymers and Polymer Materials 1974 provides a standardized abbreviation of the various synthetic polymers and polymer materials. The text also provides the basic definitions of various terms related to polymers. The book will be of great use to researchers and professionals whose work involves polymers and other synthetic materials.